I felt that the turn signal lights on my Stella 4T were a bit anemic, so I wanted to change the stock incandescent bulbs to LEDs. I have never done this before, and found that information on this mod was a bit sparse, so I decided to document my experience to share with others. One of the threads I found mentioned this website: http://autolumination.com/ as a source for LEDs. I entered 7507 in the search box, and then used the FIND function of my browser to search for available LED bulbs. As maximum visibility was my goal, I decided on the on the 7507 PY21W Tower European Bulbs with 60 High Powered Wide Angle SMT LEDS. At $19.99 each, I decided to get a pair of them and see how they worked out. I replaced both rear signals, and the LEDs are a much brighter, work in place of the stock bulbs with no other mods, and they are invisible inside of the lenses when not illuminated. However, the blink rate is much slower. A bit more research showed that the stock flasher relies on the higher current draw of the incandescent bulbs to blink at the correct rate. To remedy this, a solid state flasher is needed which will work with both LED or incandescent bulbs in any combination. 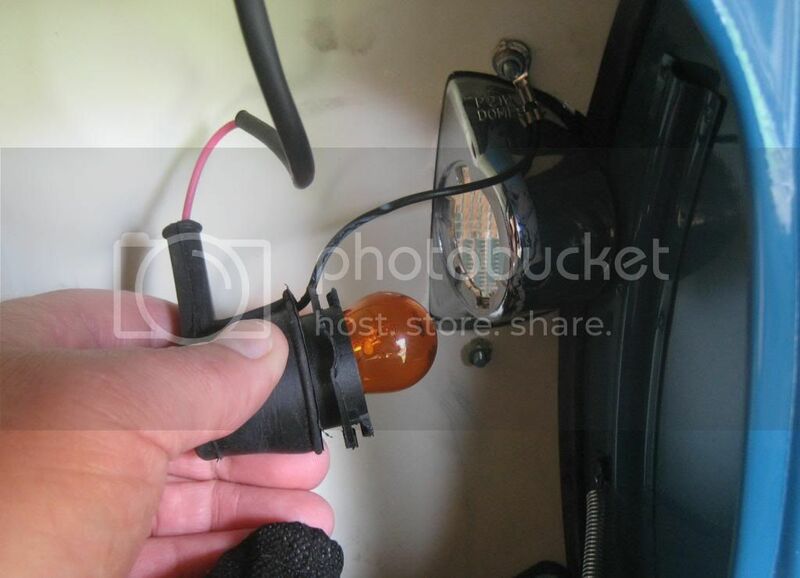 In order to ID the correct blinker needed, I had to pull the stock one from the Stella, and compare it to those on the autoillumination website. 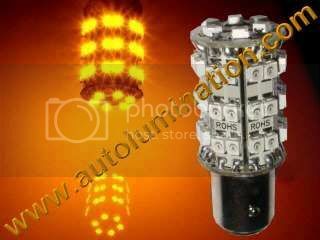 Well, I broke down and ordered the solid state flasher unit (# EFL-2) from autolumination.com, as well as two more 7507 PY21W Tower European Bulbs with 60 High Powered Wide Angle SMT LEDS for the front turn signals. Once I receive those, I will take more pictures and post my results. I'm so glad you decided to do this. I was doing all the research to get the LEDs in both front and back along with the flasher, but never but the bullet, I think because my Stella was in the shop for like a month. I'm very excited to see how this comes out! I agree that he turn signals are not as bright as I would like them to be. The rest of us appreciate it! I received the two additional LED bulbs and the solid state flasher this afternoon. I am hoping to get them installed, and get some photos tomorrow. 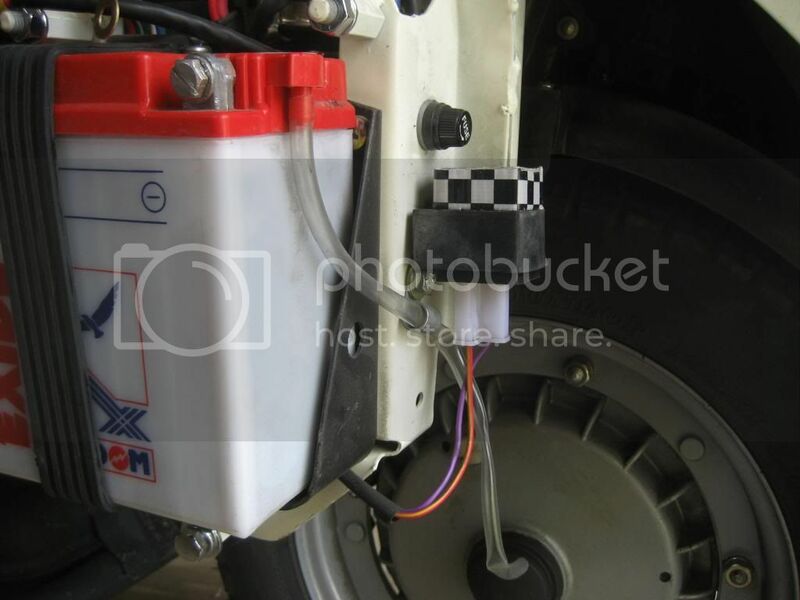 Since we are working with the electrical system, the first thing to do is disconnect the negative lead from the battery for safety. 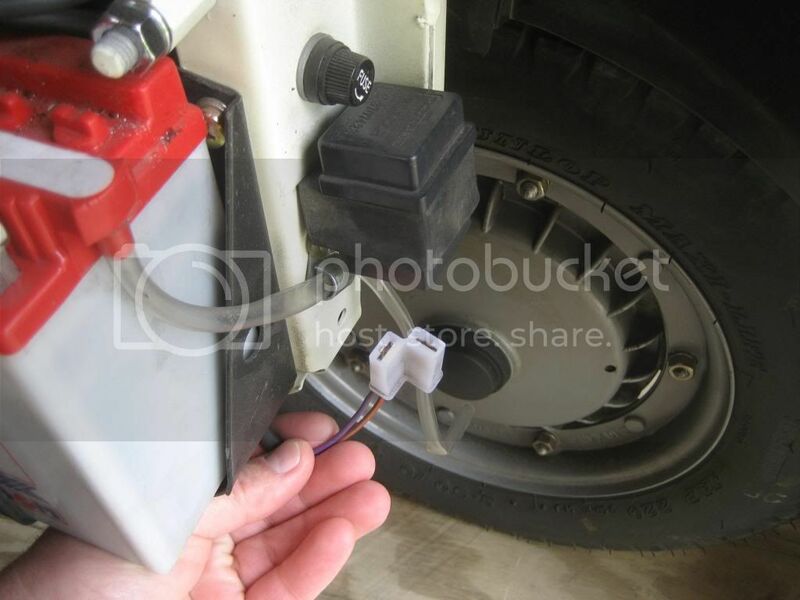 Then you can remove the plug from the bottom of the flasher. Pull on the plug, not the wires themselves. A little wiggling will get the wiring plug free. 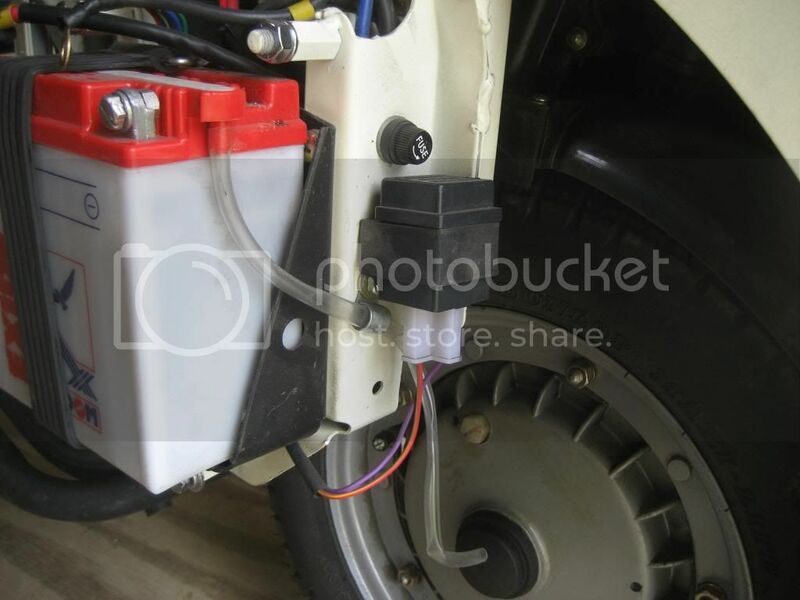 Next, plug the wiring into the flasher, and reconnect the battery. Then test the turn signals. This flasher works with any type or mix of bulb: Incandescent or LED. After changing the flasher, swapping out the front bulbs for LEDs is a breeze. The best news is, the front bulbs are accessable through the inside of your glovebox, so you do not even need a screwdriver. Open your glovebox, and with a twist and pull, remove the socket. When you are done, perform a final test to be sure all of the LEDs and the flasher work properly. That's it! 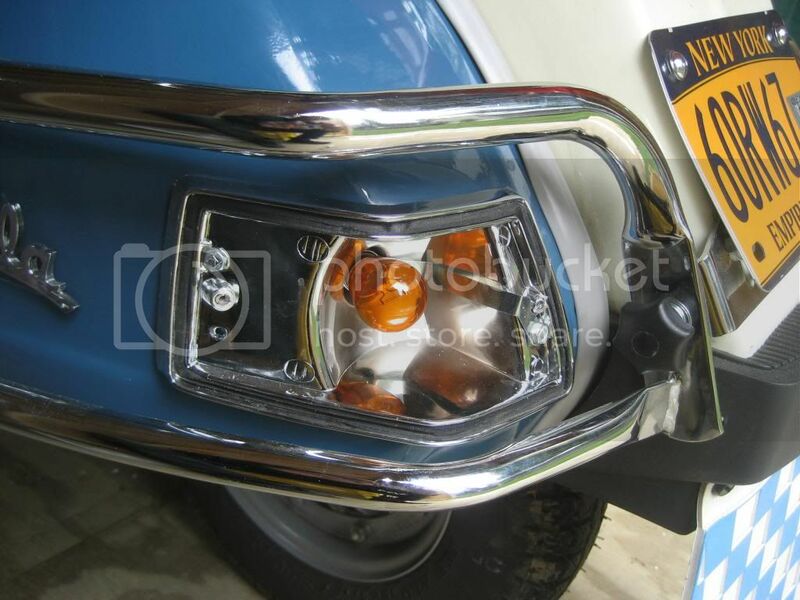 Now you have brighter turn signals, with a solid state flasher that is unaffected by current draw, blown bulbs, or cold weather. 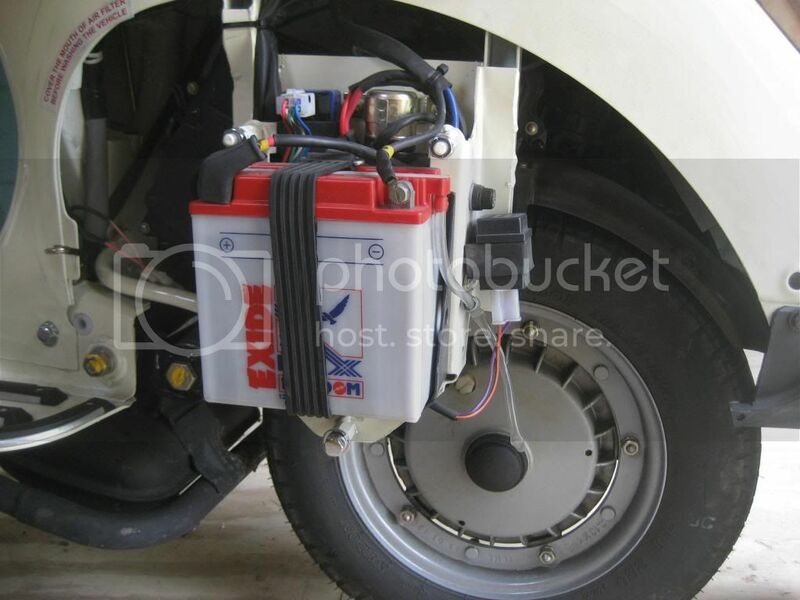 EFL-2 two prong solid state flasher unit. Awesome! Going to do it to my P200 as well. Thanks. EDIT: Any plans to do the brake light/tail lamp? Great write-up & contribution ...... nice going! 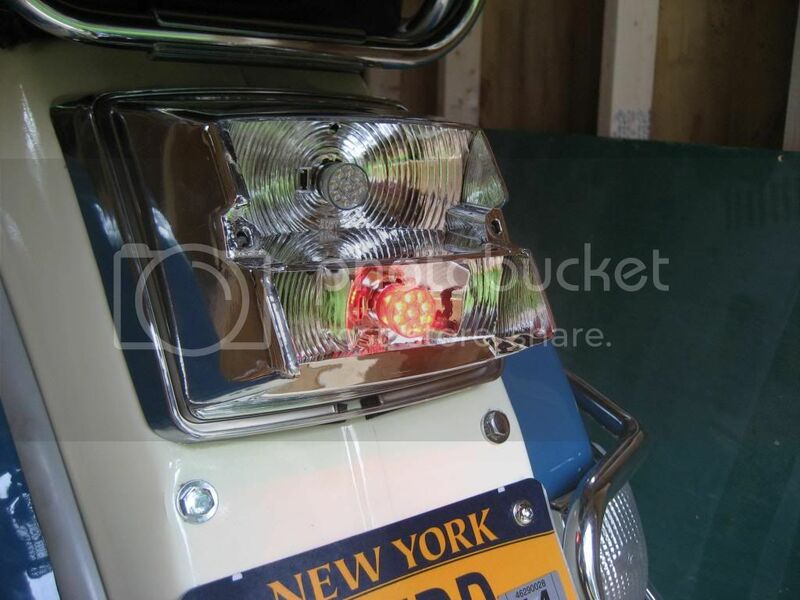 But I really want to swap out the stock taillight fixture for an acorn style, before I blow another $40 on LEDs. Although I like the instant on/off provided by the L.E.D.s I found that simply going to the solid state relay with its almost zero draw, increased the stock bulb output tenfold. In addition, as you probably noticed with your mod, the instrument signal bulb is now at least double the brightness.......this also with just the relay change. 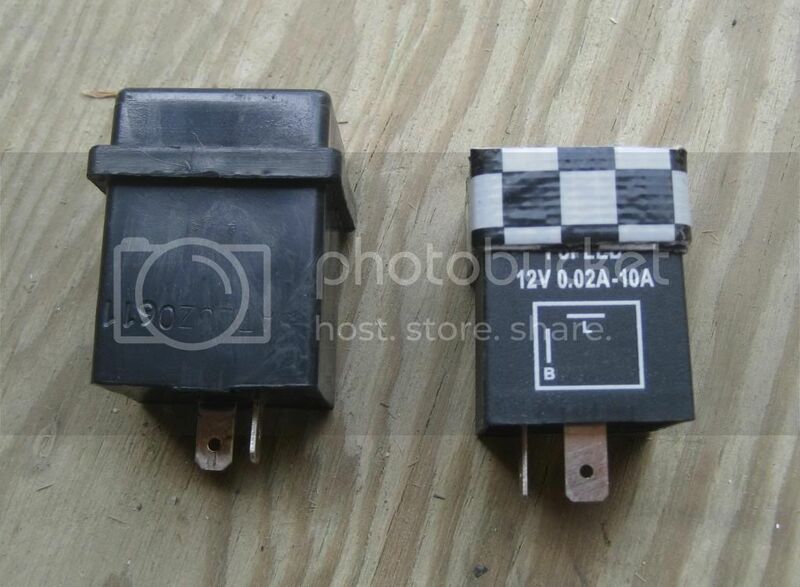 I just used a two pole Tridon (brand name) solid state relay found at most auto parts stores. Well done sir. Do the signals blink slower, faster, or at the same rate now? I personally think they blink a little too quickly stock. The signals blink just a bit faster with the solid state flasher, but I don't feel that is really much of an issue. OK, I decided to spring for LED brake/tail lights as well since I am not sure when I will be changing the tail light. and chose the 15 Led Matrix type bulb in Red to replace the stock 5007 and 5008. make sure you order the BA15s version with one electrical contact on the bottom. I chose this bulb as I was worried about clearance problems with the longer bulbs. Time to put the lens back on and install the screws. But wait! I have been working to remove all black rubber, plastic and hardware from my Stella, so it was off to the hardware store. 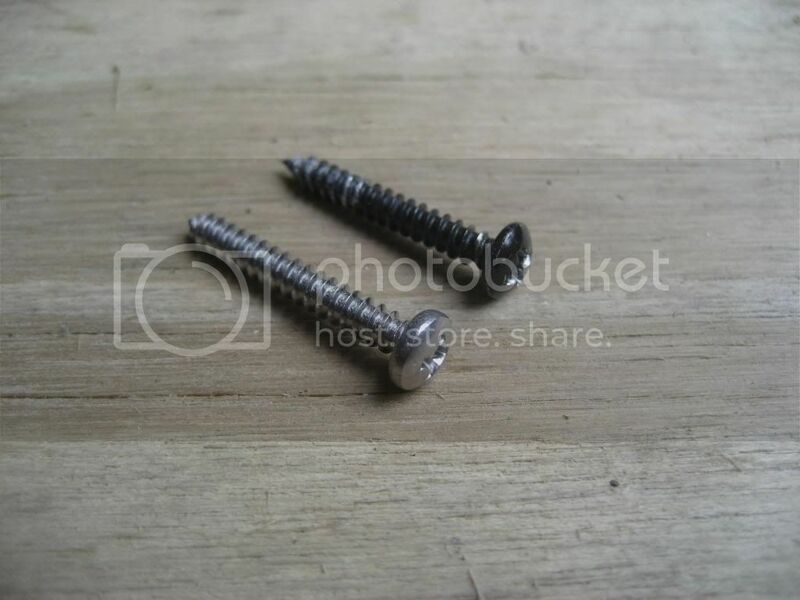 There I picked up a replacement screws and washers made from stainless steel. I installed the shiny news screws, and they look great! 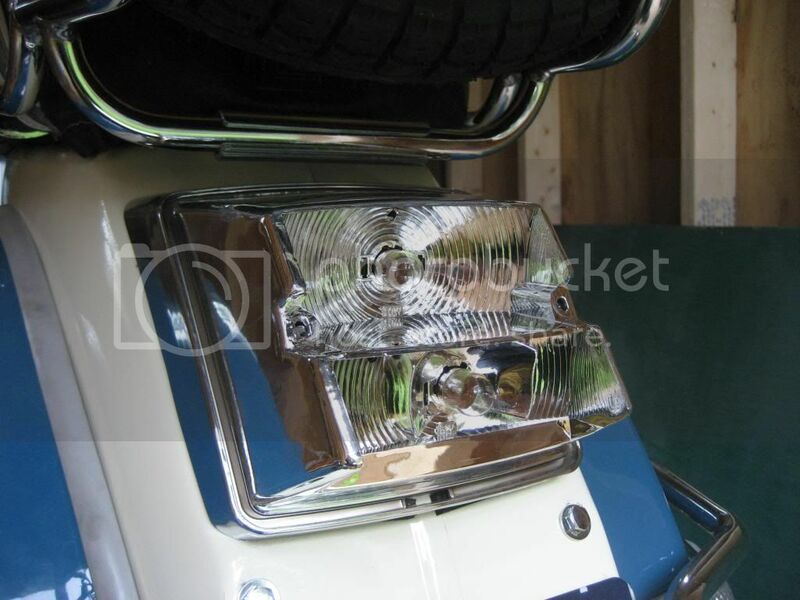 I have replaced all the bulbs on the Stella now except those in the headlight. They are much brighter, and draw far less current. 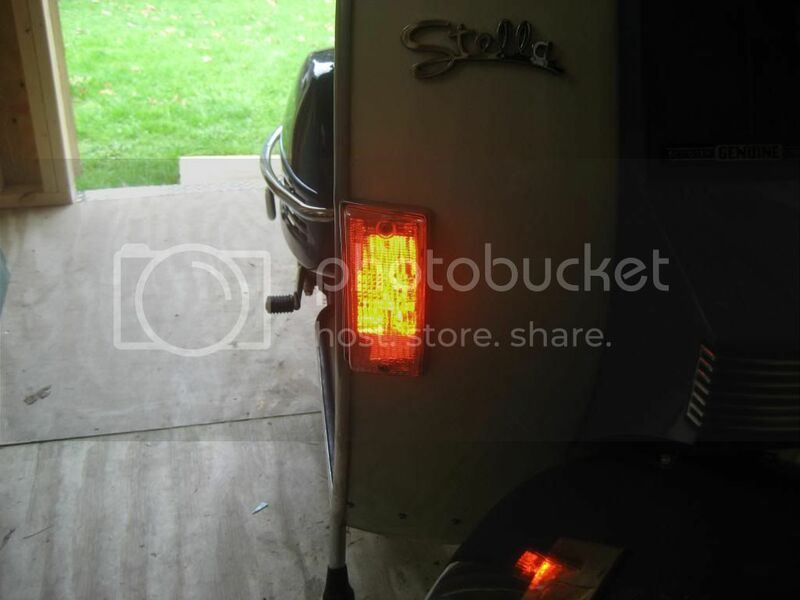 Posted: Fri Jul 12, 2013 6:47 pm Post subject: Anyone put a solid state flasher in an older Stella 2T? Great posts about the LED upgrades -- I ordered all the parts, but discovered that the flasher on my Stella 2T is completely different. Anyone have any info about swapping out the stock 2T flasher for a solid state one?? 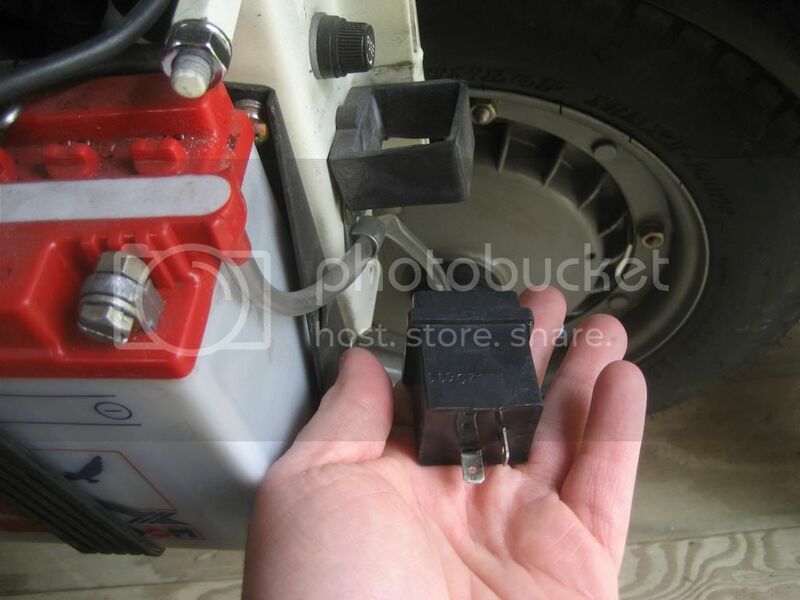 Can you post a photo showing the plug configuration? 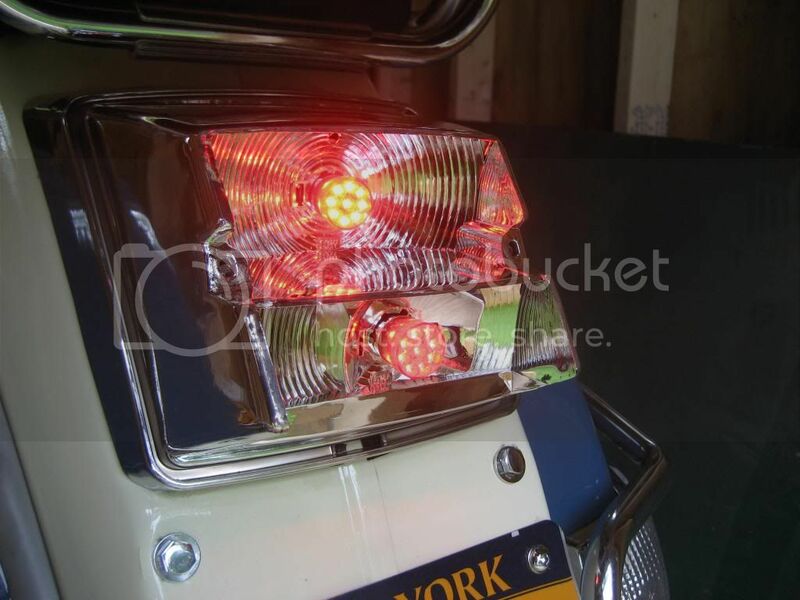 How does the new tail light work? Is it really bright? 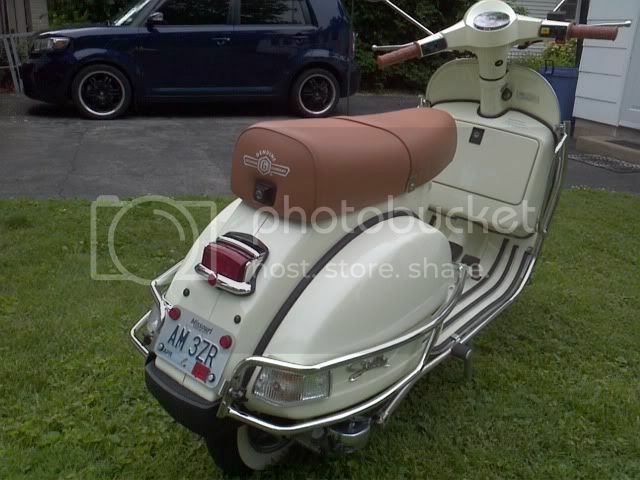 I think it is the weakest light on the scoot and I worry about it whenever I ride at night. I want to get something that is as bright as the tail lights on a car. How do you think it compares? 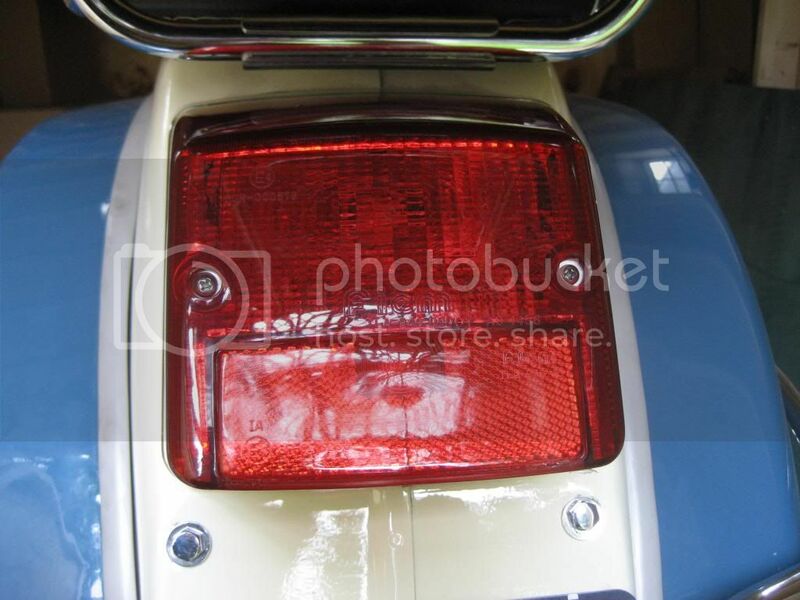 I'm planning to order my stuff from Autolumination this week, but want to get the right tail light. Thanks! It is brighter than the original but not blazing. I'd say a 50+% improvement. 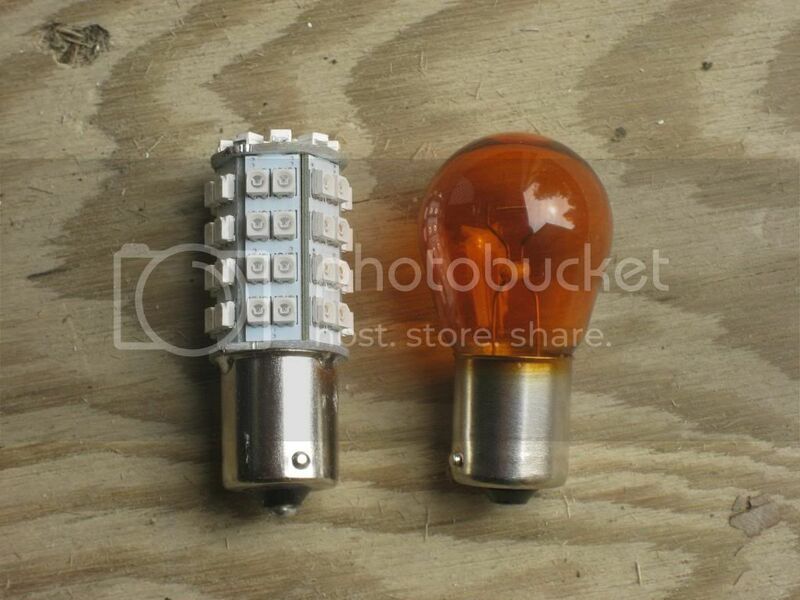 The solid state flasher is the critical item much more juice getting to the bulbs. 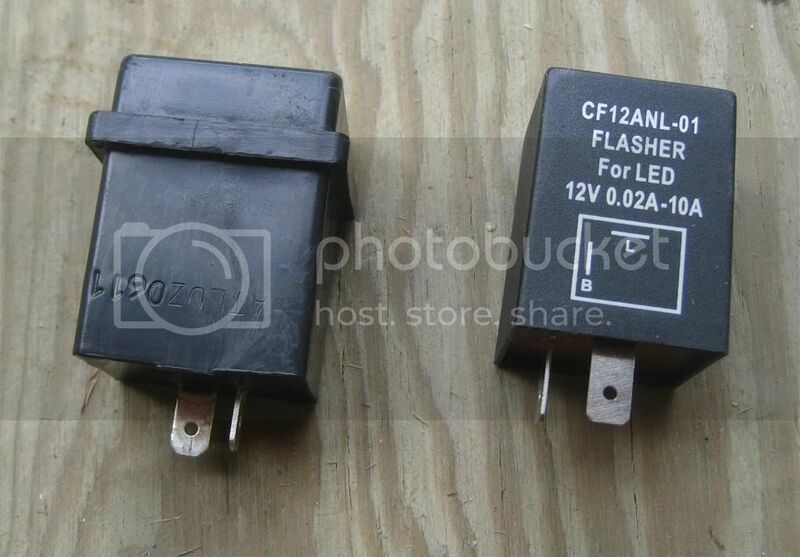 Did we ever find out what the difference is between a 4T and the 2T flasher? I would really like to do this conversion as well! Nope. You should post a picture of your flasher and then these get a will be better able to help you out. Might give that a shot tonight. The LEDs look great and I've been having weak light problems anyway. What would you say total cost was - incl. taillights? 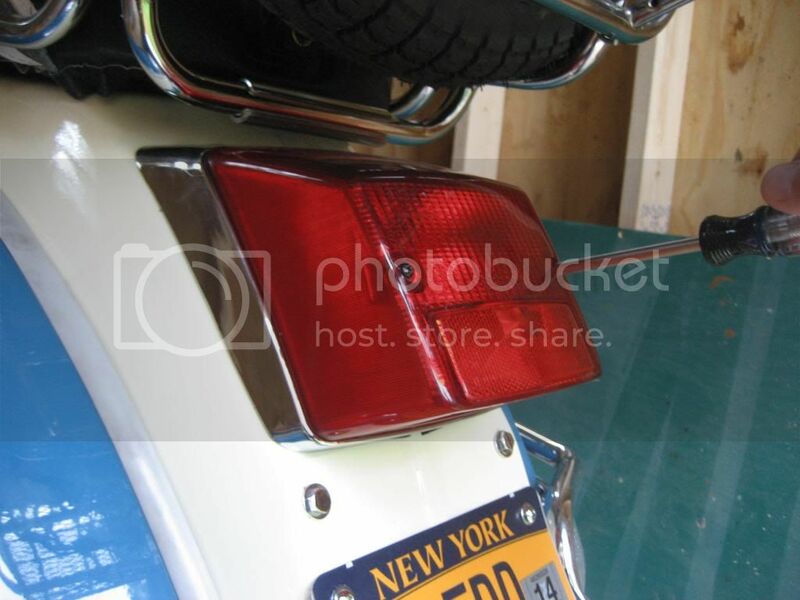 One option for a brighter taillight is to just swap out the whole unit.. If you can spare the coin..there are many options.. This one went on my 2010. Ok, so I did the turn signal install with all of the same parts that you used. My signals don't flash though, they just stay on. They work, they just don't flash. I can't imagine what I could have missed here. Also, the turn signal chime doesn't function anymore either. Is this something that has to be disconnected for the LED bulbs to work? Hopefully some electronics wiz will have some advice! Re install the original bulbs in the front only. You may have a relay that needs to see a bit of load. If they then work, your sounding device will also work. When I did the same thing last year I had the same situation. Stuck the front bulbs in and worked fine. Sometimes, the electrical load has become so low the relay can't 'see' it. In that case, if you want to stay LED front and rear a resistor needs to be installed in line with each signal harness. I just stayed with the stock fronts. This does sound like a relay issue. Did you purchase a digital relay strictly for use with LED bulbs? 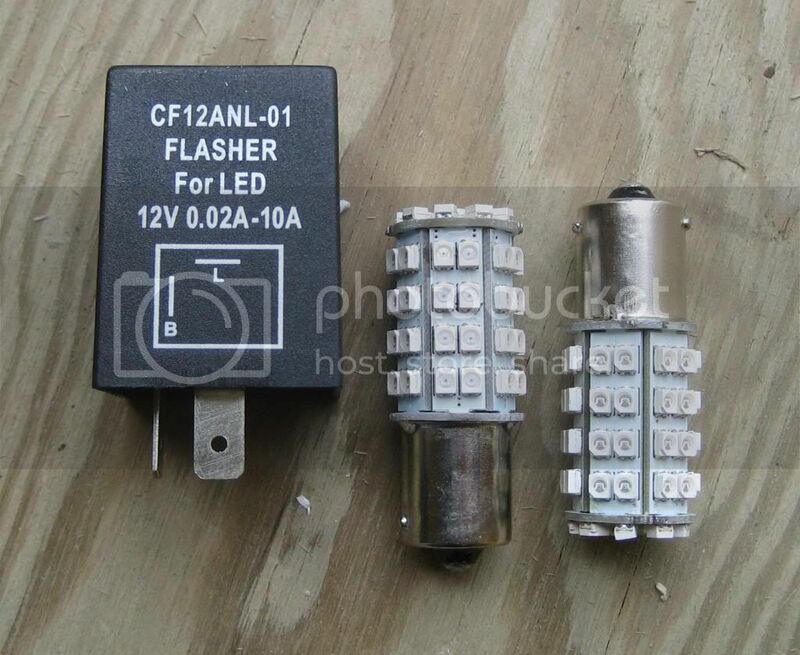 I bought the same EFL2 LED flasher from autolumination. So I don't know why the flasher would work for you and not for me! 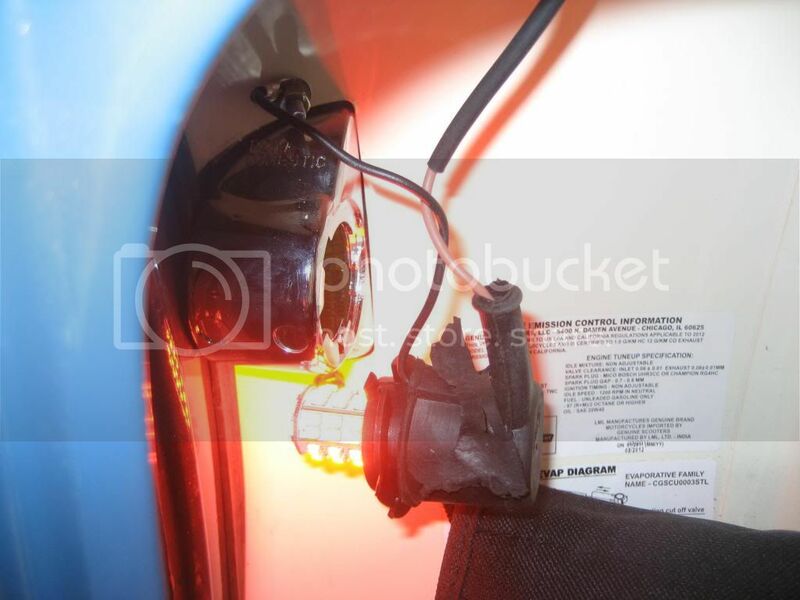 Autolumination's website says that the flashers are designed to work with incandescent and with led, mix and match and it should work regardless. So, I put the incandescents back into the rear signal housings and it still wouldn't flash. Interestingly, with the incandescents in place, I got a faint, solid, chime from the signal chime. So, I then put the old flasher back in and now the signals and chime work normally, except with led bulbs in the front. I know little to nothing about electronics, but it seems to me like the chime has something to do with this. Slotrod, do you have your chime hooked up or is it disconnected? Although new then I suspect you got a bum flasher. I agree. Sounds like the flasher is bad. It happens...They should send you a new one no problem. Bummer, well, hopefully there wont be a problem getting a good one from them. Just follow the return process on their website. Nice! I may have to make the same swaps soon. I wish I could figure out how to take the turn signal indicator (but not the lights) off the relay, but I don't think there's a way. I played with a number of buzzers and beepers and my favorite had a built-in relay. So it sort of stuttered due to the relay in the cowl. I guess I could wire something from the buzzer directly to the switch but what a pain. Yeah, the chime is so horrible. But, people always look, so if it makes me more visible, I'm ok with it. 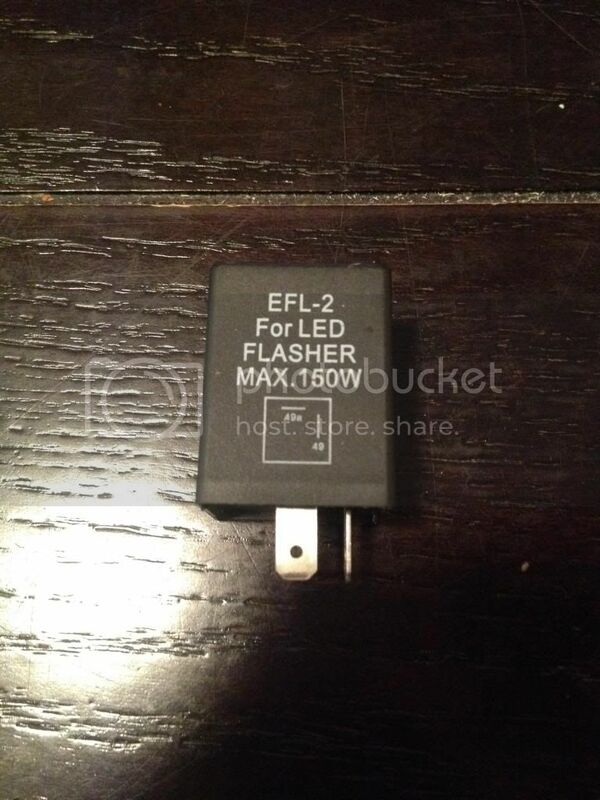 Does your new flasher say: 12v .2-10a? I don't see that on your pic. maybe they send you the wrong flasher? Well, I am not glad they sent you the wrong flasher, but at least you know what is wrong, and you should be OK with the correct one. Delete due to severe dislexia! Idono what I was thinking, sorry, I had it all backwards. I am not sure that is the case. Red lenses block everything except red light. If red lens blocked red light, then no light would escape. Can anyone succinctly specify what I would need for a 2T Stella (especially the flasher)? I can't acertain it clearly here in the discussion. 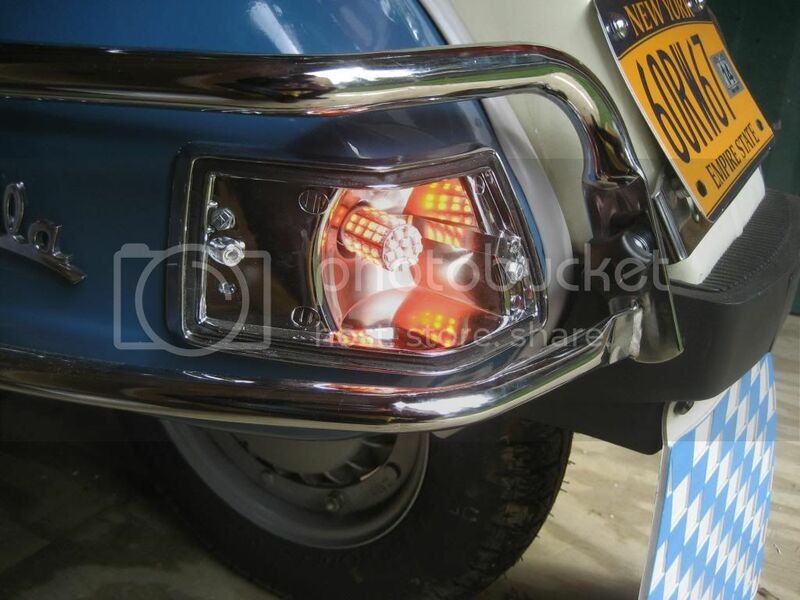 To change your turn signals, you would need 4 LED bulbs and a digital flasher. I love the way those LED lights look! 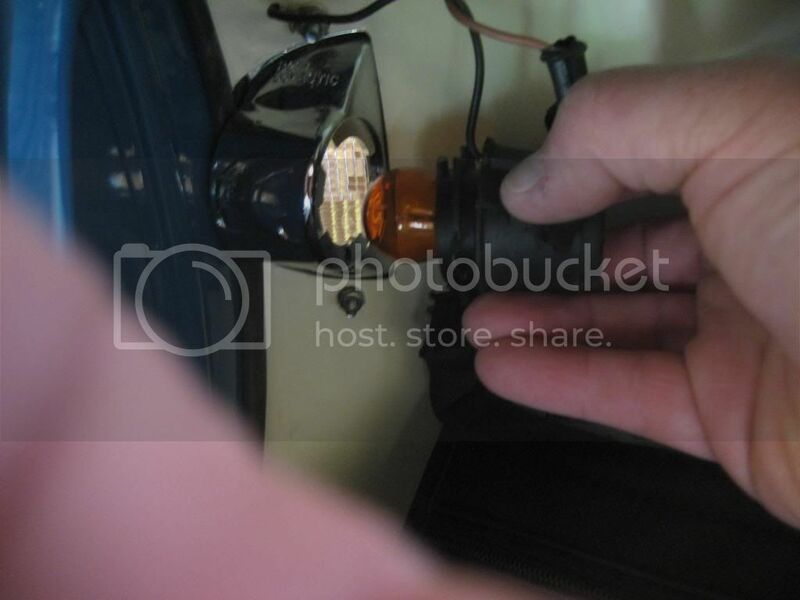 I just purchased a Stella auto and was wondering if I could change the bulbs as well. Sorry I'm just such a newbie, that I wanted to ask before I start something I might regret later. Any info would be great! All I want to do is customize her and make her shine! I noticed a problem. 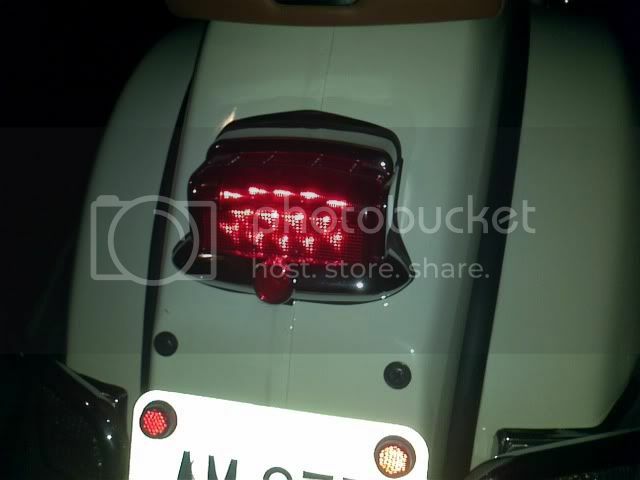 The taillight bulb is also the license plate light bulb. 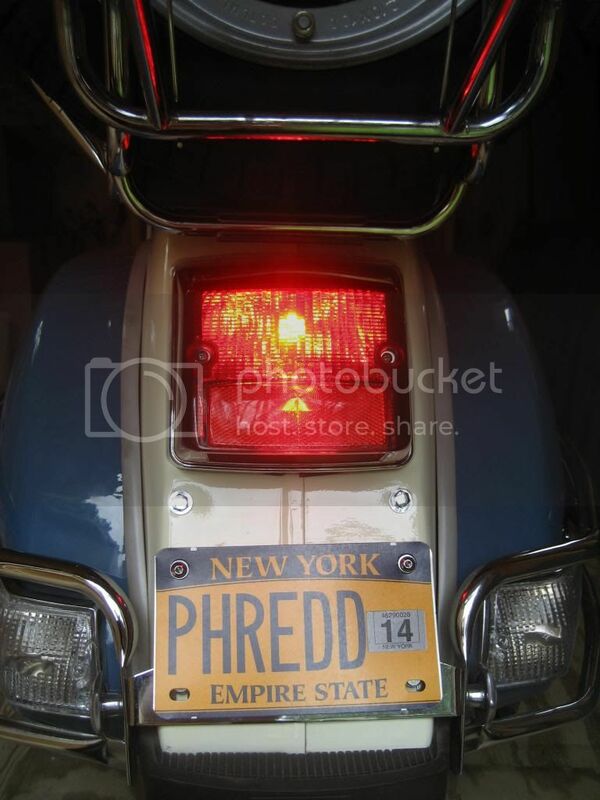 You put a red led bulb in, so your license plate light will be red, not white. 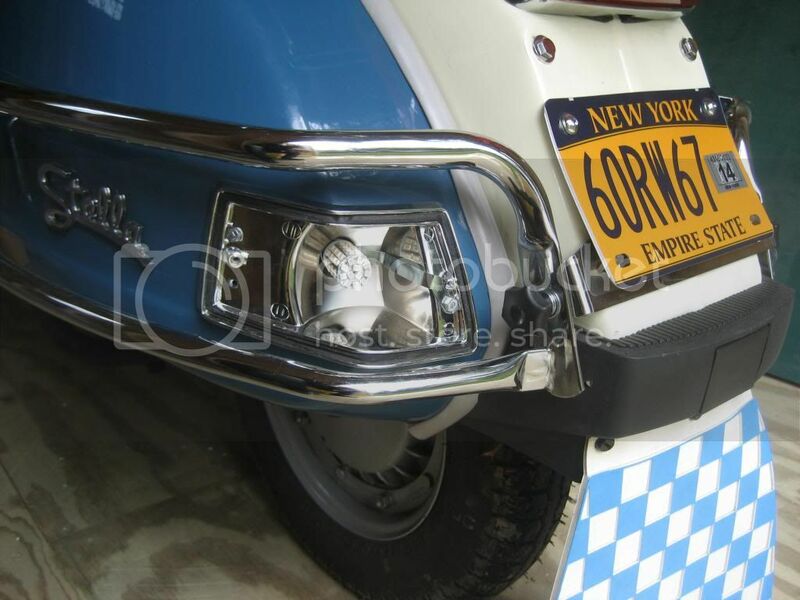 Most States require white license plate lights. Just something to be aware of. 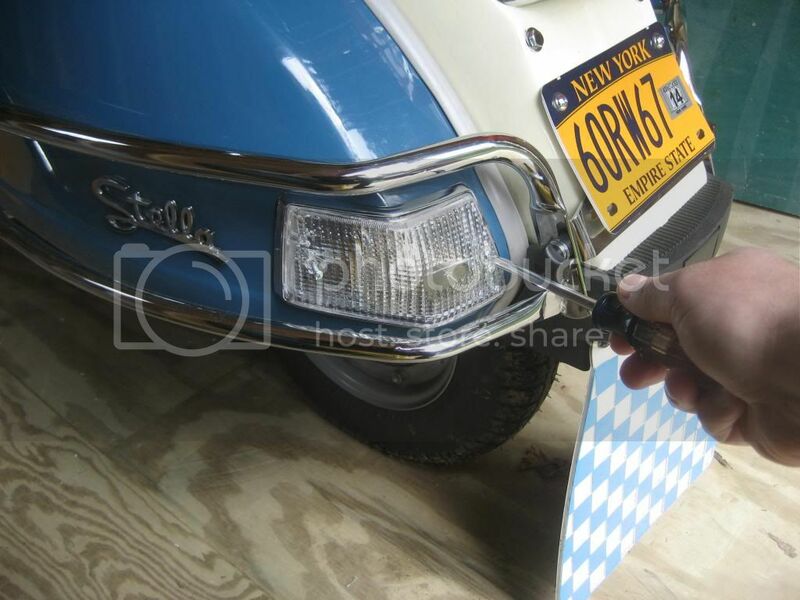 minilynnie: Changing a Genuine Stella to LED is easy as long as you can turn a screwdriver. Just read through the thread a few times, especially the after comments where others have added their experiences, and follow the steps. Hapi-Snack. If you have a state that requires a white license plate light, add a white bulb instead of a red one.